The term ‘winged scapula’ (also scapula alata) is used when the muscles of the scapula are too weak or paralyzed, resulting in a limited ability to stabilize the scapula. As a result, the medial border of the scapula protrudes, like wings. The main reasons for this condition are musculoskeletal- and neurological-related. M.trapezius (pars descendens), M.serratus anterior, M.rhomboidei, N.accessories, N.thoracicus longus, Plexus brachialis. • Acute traumas, for example a direct shock on the shoulder during a car accident with a sudden traction on the arm. Most of these patients describe a sever or excruciating pain, often keeping them awake. Most of the painful scapula alata are caused by a neurological trauma. But a winged scapula is not always painful, this is often with a muscular scapula alata. Other patients feel a moderate pain and some are experiencing no pain at all. Any infringement of the plexus brachialis, N.accessorius or N. Thoracicus longus is susceptible to provoke the winging of the scapula. The causes are multiple and new ones are frequently discovered. A visible angulus inferior and a pronounced anterior tilt of the scapula can be observed. The causes for this type are: shortening of the M.pectoralis minor, shortening of the posterior joint-capsule and muscular unbalance of the M.Trapezius pars ascendens and the M.serratus anterior. 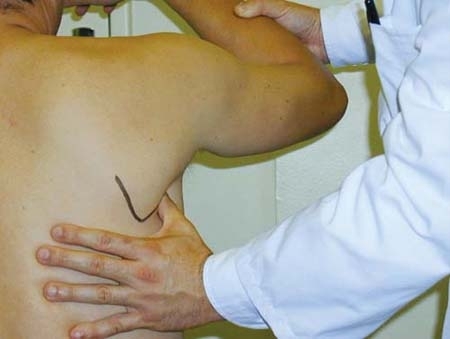 A visible margo medialis and an intern rotation of scapula can be observed. The causes are: shortening of the posterior joint-capsule, shortening of the M.latissimus dorsi and muscular unbalance of the M.trapezius and the M.serratus anterior. A visible angulus inferior and a downward rotation of scapula can be notified. The causes are: shortening of the M.levator scapulae and muscular unbalance of the M.trapezius pars descendens and ascendens. The characteristics of type 1 are a separated scapula of the thorax, elevation of scapula and the margo medialis comes closer to the spinal line. These causes are related to damage of the N.thoracicus longus and an insufficiency of the M.serratus anterior. The characteristics of type 2 are a separated scapula of the thorax, lowering of the scapula and spreading of the margo medialis against the spinal line. The causes are damage to the N.accessorius and insufficiency of the M.trapezius pars descendens. The therapist offers an isometric resistance against a scapular elevation in midrange of motion. With a type 1 the angulus inferior becomes visible. Then the therapist asks the patient to execute a protraction, afterwards he repeats the resistance-test. If the scapular posture deviation increases or stays the same, the conclusion would be: a dysfunction of the M. Serratus anterior. If it decreases then we have a dysfunction of the M. Trapezius pars ascendens. • The humerus is passively placed into endorotation behind the back. The capsular tension will bring the scapula to the front. It’s also a test to conclude a shortening of the M. Latissimus dorsi. • When the patient lifts his arm we see a charged excessive acromion, now we can explain that there is an excessive activity of the M. Trapezius pars ascendens and a low activity of the M. Trapezius pars descendens. This phenomenon is called the ‘shrug-phenomenon’. There’re surgical treatments with patients being very satisfied about the result. But some studies prefer a non-operative treatment especially in case of older patients who are sedentary and with minimal symptoms. In the revalidation we have to give attention to diverse monitoring parameters. Timing, muscle activity, muscular balance, endurance and power of the scapular muscles are important in the revalidation program. 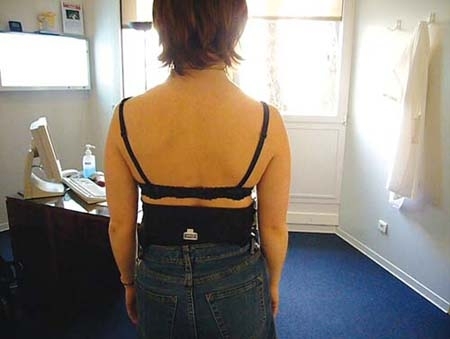  Correction scapular position with tactile feedback on the level of the angulus inferior and ask the patient to move the scapula downwards and inwards.  The patient put his fingers on the processus coracoideus, after this the patient moves his scapula backwards (medio-cranial) with his fingers on the processus coracoideus. • We can give some physical exercises for the scapula. First conscious muscles activation of the scapula, then automate exercises for the scapula muscles and at last dynamic exercises for the muscles of the scapula. [Parsonage-Turner syndrome: Unknown but not infrequent. Apropos of 6 cases].